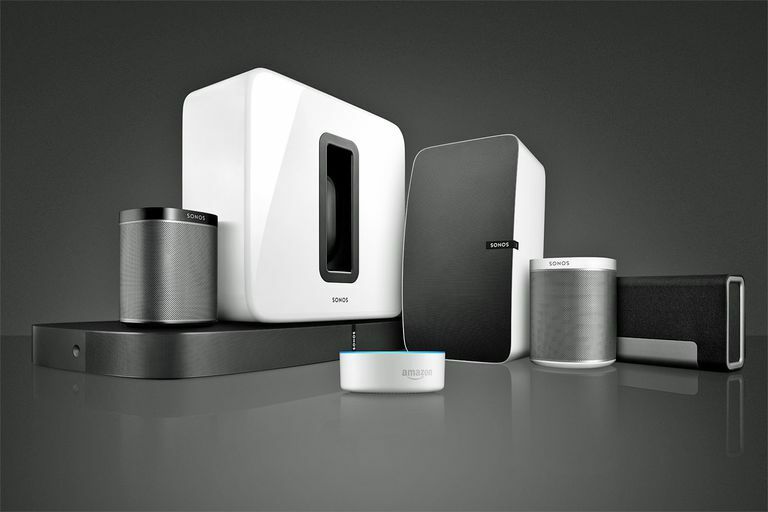 Sonos Family with Echo Dot. Alexa can perform a variety of tasks, including streaming music. When paired with Sonos, you can create the ultimate smart home music system. Let's take a look at how to connect Sonos to Alexa. Link an Amazon Echo device with any Sonos Wireless Speaker (aka Sonos Player), Playbar, Playbase, Connect, Connect: Amp and use an Amazon Echo to control Sonos features. Buy a Sonos One Wireless Speaker or Sonos Beam Soundbar, both of which have Amazon Echo functions built-in. An Internet connection with Wi-Fi router. Sonos system running the latest update. An Alexa enabled device, such as an Echo. Plug in your Sonos product to power. Download the Sonos app to your phone, tablet, or computer that's connected to your home Wi-Fi network. For Android, you can find the Sonos app on Google Play or Amazon; for iOS, the Apple App Store. Open the Sonos app and select Setup New System. When you're presented with a choice between Standard or Boost setup, select Standard. There may be situations where a Boost setup is required. Follow additional steps to set up your specific Sonos player(s) or speaker(s), such as those shown in the above photo. Once you have your Sonos system up and running, here are the steps to link it to Alexa and Echo. If you haven't done so already, download and install the Alexa app on your smartphone. You can find it on Google Play or Amazon or the Apple App Store. Open the Alexa App on your smartphone and set up your Echo device. Search for Sonos and tap the Sonos Skill. Tap Enable and sign-in to your Sonos account. Tap Smart Home in the Alexa app menu. Tap Devices and Discover. If you have more than one Sonos Player, make sure they all appear on the discover list. Once you have determined your Sonos player(s) have been discovered, you can start using Alexa to control your Sonos speakers. In order to use Sonos to access streaming music services that Alexa can control, the services must be added to both the Alexa and Sonos Apps. Follow any additional steps that may be prompted. Available for streaming in Australia through Alexa on Sonos, but not available within the Sonos app. Here are examples of the types of Alexa commands you can use to control Sonos speakers (precede each command with the wake word "Alexa"). The skip and previous commands don't work with TuneIn radio, and the previous command does not work with Pandora or iHeartRadio. Volume commands will only affect the speaker/player the command is directed to. If the speaker/player is part of a group, the group volume will not be adjusted. It is important to note that non-musical commands (weather, news, shopping, etc...) will only play through your Echo device, not through your Sonos speakers. The only exception to this is with the Sonos One or Sonos Beam, as they combine Echo and Sonos Speaker functions within the same unit. With the Sonos One and Sonos Beam, an external Echo device is not required to use Alexa voice control, as it is built-in. However, you still need to perform some steps to activate Alexa after you have performed the Sonos part of the setup. To get started, make sure the Sonos One and Beam are connected to your Wi-Fi router and go through the Sonos portion of the setup just as you would with other Sonos products. Once done, proceed to add Alexa. Using the Sonos app, go to Browse > Add Voice Control and tap Add Amazon Alexa. Alternatively, go to the More tab, tap Voice Services, then tap Amazon Alexa. Tap Connect Your Amazon Account and log-in. If you don't have an account, create one before moving on to the next steps. Once logged in, the app will have you test Alexa to make sure it's working. Remember to make sure the Alexa app is installed on your smartphone. In the Sonos app, tap Enable the Sonos skill or go to the Alexa app and enable the Sonos skill from there. Add music services to Alexa. Tap Verify Music Services on Alexa. Refer to the services listed in the previous section on connecting Echo devices to Sonos players. Link your music service accounts to Alexa and choose a default music service. The services must be added to both Alexa and Sonos. Using voice commands to group rooms or move the music to another room. Using voice commands to access your local music libraries, such as music stored on a PC or media server. Change the Sonos One or Sonos Beam wake word. If the Sonos Beam is connected into to a TV that has HDMI-ARC, you can use Alexa to turn the tv on and off. Beam also follows commands such as “Turn it up” and “Mute,” applying them to the TV volume. Alexa TV control voice commands don't work if the TV is connected to the Sonos Beam via the digital optical connection. Tune to a channel by number. Play shows by name on select services, such as Netflix and HBO Now.